Afternoon Closings happen! Many shops and businesses close down for the afternoon from 1:00-4:00 p.m., especially outside the city centres. Schedule your lunch accordingly. Italians go home to enjoy lunch as a family and relax. Dinner starts after 7:30 and often after 9:00 p.m. Getting to the restaurant early and claiming starvation won't change that. Making a reservation is appreciated. Get off the beaten track for a meal in a suburban area, relax somewhere with a coffee or cicciolata calda or a gelato. 'Coperto' is the cover charge, the amount charged, per person, for you to sit down at a table. Be assured that a coperto is not the same thing as a tip. Ask for the bill as it isn't usually delivered automatically to your table after a meal in a restaurant. When you do ask for the bill, "il conto, per favore" works well. Tipping in Italy is not absolutely necessary [thank goodness - they are paid a living wage!! ], and when added should be 5 - 10%, dependent on your rounding it up. I tend to tip when the service has been great ... and most often it really has been. I guess I do make the effort for some interaction [not distraction] with the staff [given I do speak some passable Italiano] and am prepared to tip accordingly. Speaking Italian ... I always cringe when I hear tourists ask the locals, "Do you speak English?". It's much like an Italian walking around in Tokyo asking the locals "Parla Italiano?". Learning a few local words, whatever country you're in, helps immensely. If you have no Italian whatsoever [however unlikely that may be, as everyone at least knows buon giorno, per favore, scusi. grazie, si and no] then at least start the conversation by saying something like, "My apologies, my Italian is not very good. Can you help me?" However, learning a few words and common phrases will make a big difference to your Italian experience. On a few occasions it has served me greatly. In an unnamed vineria in Venezia I get 'prezzi locali' each year as, given my attempts at Italian, they appreciate the fact that I am trying. On another occasion, on the Grand Canal, of all places, I had a late night chianti [of the barman's choice] and feeling up to a second round, asked for another, but perhaps a different type because the first one was "cosi, cosi" [so-so]. I wasn't complaining, just commenting. He raised his eyebrows, selected another brand and poured a generous refill. On my departure he refused payment for the first glass, saying I hadn't enjoyed it!! I protested [ok, a little feebly] but he was insistent. Great service! Pack one or two strong bags with you for your shopping. Supermarkets either don't supply plastic bags for your groceries or they charge for their supply. The first time I discovered this was when I reached the head of a queue in a supermarket and the cashier was half -way through ringing up my large range of purchases ... no bags meant I had about five trips to the car with my arms laden with loose items, dropped some a few times, and generally ticked off all of the customers behind me. You can always double up and use the bags for your dirty laundry .... or maybe not! I always take a 3 meter light-weight cord with me. This can be used to tie things up but is far more valuable as a clothes line strung up over the central heating or in the bathroom. I also generally have a small amount of washing powder in a strong, resealable bag. Not a huge amount but better to have it on hand than to have to buy a big container for a two to three-week stay and then discard the left-overs ... all depending on your packing abilities and how many clothes you brought with you. It's not meant to make you paranoid but always think before stepping out and avoid risky 'situations'. Try always to carry your own water when travelling or out sightseeing. This can mean filling up at your accommodation. Or, simply take an empty water bottle or collapsible water bottle with you. If you need to discard the plastic bottle think before you do so. Even placing it on top of the garbage can doesn't mean it will stay there. I have been to Venezia many times and the biggest eyesore in the waterways are the plastic water bottles carelessly discarded by tourists! Yes, I'm Australian, and I'm fair-skinned and all that ... and highly sensitized to the effects of the sun. I think I've paid for all the recent overseas holidays of my skin specialist [and the private school fees for his kids!]. So, Colin, if you're reading this, I do now pay attention. This website provides details of reciprocal health care arrangements with a number of countries, including Italy. We pass no comment on, or interpretation of, the information presented below. Covers the cost of essential medical treatment for Australian residents travelling in some countries. Reciprocal Health Care Agreements aren’t designed to replace private travel health insurance for overseas travel." PLEASE DO NOT RELY ON THE INFORMATION PROVIDED BELOW! THIS IS TO DO WITH ELECTRICITY, AND WRONGLY USED IS DANGEROUS. ALWAYS CONSULT EXPERTS - WE ARE NOT!!! 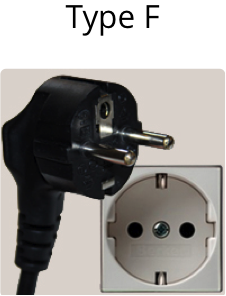 There are essentially three type of plugs in use in Italy - Types C, F and L.
Below is information extracted from the worldstandards website. Bear the following in mind there are many electrical gadgets we use today ... laptops; iPad / iPods; cameras; mobile / cell phones; razors; CPAP machines; nebulisers etc. Whilst an 'all-in-one' electrical adapter / converter [or a few of these] may be of great assistance remember not to overload the power source [especially by 'daisy-chaining''] or by trying to charge / use everything at once. Type C is probably the single most widely used international plug. This two-wire plug is ungrounded and has two round prongs. The plug has two 4 mm round pins, measuring 19 mm in length on centres spaced 18.6 mm apart at the base and 17.5 mm apart at the tip. Since type C sockets are ungrounded, they have become illegal almost everywhere and they are being replaced by type E, F, J, K or N (depending on the country). So as to leave no doubt: only the sockets have become illegal, the plugs remain in use of course. A type C plug fits perfectly into a type E, F, J, K or N socket. Used almost everywhere in Europe & Russia, except for the UK & Ireland. Type F is similar to C except that it is round and has the addition of two grounding clips on the side of the plug. The plug has two 4.8 mm round pins, measuring 19 mm in length on centres spaced 19 mm apart. 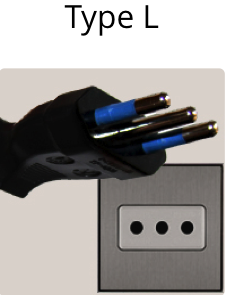 The distance between either of the two earthing clips and the middle of the imaginary line connecting the centres of the two power pins is 16 mm. A type C plug fits perfectly into a type F socket. The socket is recessed by 15 mm, so partially inserted plugs do not present a shock hazard. Used almost exclusively in Italy. The Italian grounded plug/socket includes two styles rated at 10 and 16 amps. Both plug top styles consist of three rounded pins placed in a straight line. They differ in terms of contact diameter and spacing, and are therefore incompatible with each other. The 10 amp version has three 4 mm round pins, measuring 19 mm in length. The centres of the line and neutral pins are spaced 19 mm apart. The distance between the centres of either of the two outer prongs and the centre of the ground pin is 9.5 mm. The 10 amp style socket also accepts type C plugs. The 16 amp version has three 5 mm round pins, measuring 19 mm in length. The centres of the line and neutral pins are spaced 26 mm apart. The distance between the centres of either of the two outer prongs and the centre of the ground pin is 13 mm. I wouldn't wear one. They become uncomfortable on longer trips, especially in warmer weather. IF it is an absolute priority for your peace of mind, then definitely wear it under your clothes. It is better NOT to advertise the fact that you are a tourist [though it is unlikely we can get away with that!] but there is no sense in saying 'all my valuable things are here in one place'!! Don't wear it like a bum bag or fanny** pack out in the open. It's best too to avoid carrying anything in easily accessible back pockets, especially when in tight crowds. I was 'professionally' pick-pocketed on the Metro in Paris and wasn't even aware of it until the group left the train and I discovered my itinerary on the floor behind me. Fortunately I had all my valuables to hand in front of me. Apparently too [though I can't speak from personal experience] a 'cross-body' bag is a bit of a deterrent to drive-by thieves. ** Yes, I should write something on the meaning of phrases and common words NOT to be used in uncommon countries!